Take a trip through Madrid history on a comfortable electric bike with pedal assist that will take you to see the the most important attractions of the city center. 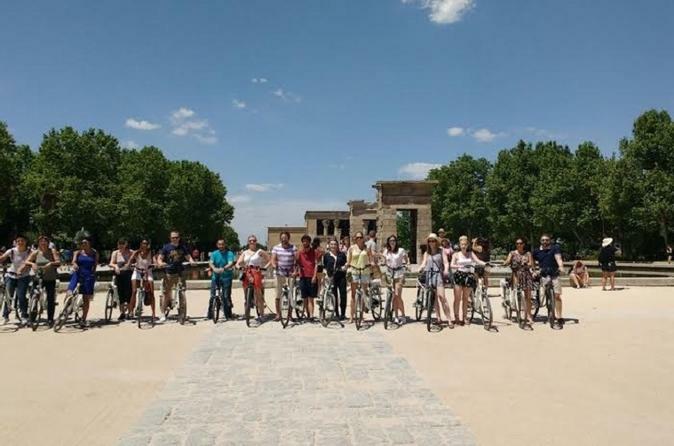 Take your confortable electric bike with pedal assist and beging a tour that will take you through the history of Madrid, Spain’s capital since 1561. Experience an eco-friendly journey from the House of the Habsburg to the 21st century. Explore sights including the Plaza de Puerta Cerrada, the site of a Christian wall built centuries ago. Departing from Plaza San Miguel, you’ll glide along the narrow streets to Calle Toledo and Plaza del Conde de Barajas, where you’ll find a number of artisan shops. Discover one of the city’s gastronomic centers at the ornate San Miguel Market. Navigate the cobblestones of Plaza Mayor, the heart of the 17th-century city center, and marvel at Casa y Torre de los Lujanes, the oldest civilian building in the city. Enjoy the view of Plaza de Oriente right between the Royal Palace and the Royal Opera Theater. and Plaza de la Armeria where you can see the main entrance of the Palace and the Cathedral of Almudena. Let us not forget the marvelous Gardens of Sabatini and Campo del Moro. Ride your E.bike along the Manzanares River, away from the traffic and the crowds, enjoying the tranquility of the area and the freedom to ride where you please. Keep up with the other members of the group without sufering even if you do not have the same endurance. and visit the best sights of the city without ending exhausted or needing to take a shower .